Vanish | Pro Chem, Inc. 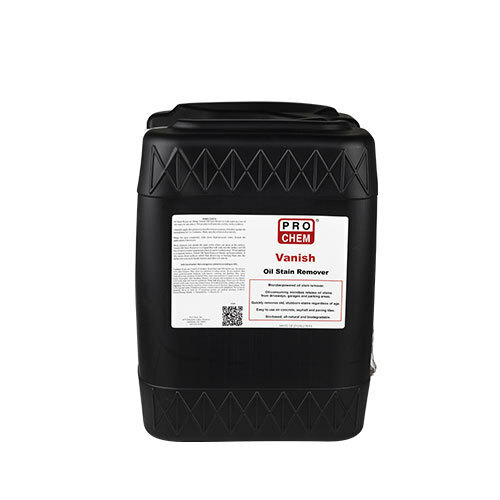 VANISH is a liquid oil stain remover that soaks into surfaces to lift the oil out and place it in suspension, where it can then be washed away. It breaks up hydrocarbons and lifts stains from surfaces rather than dissolving or burning them the way acid-based cleaners and other solvents do. The technology behind VANISH uses both microbes and enzymes, which produce complex chemical reactions that metabolize oil and grease into carbon dioxide and water. The microbes and enzymes are completely safe because they are nonpathogenic, naturally occurring and salmonella-free. These microbes are chosen for their ability to degrade hydrocarbons such as oil, grease, transmission fluid and gasoline. Oil Stain Removal: Dilute Vanish oil stain remover with water at a rate of one ounce to one ounce. The product will turn into a white, milky solution. Liberally apply the solution to the affected area and use a brush to agitate the stained area for 1 to 2 minutes. Make sure the solution does not dry. Rinse the area completely with clean, high-pressure water. Repeat the application if necessary. Auto Floor Scrubber: Do not add product directly to the auto floor scrubber. Prespray the product on to the affected areas. Add water or cleaner to auto floor scrubber and double-scrub. Allow the product to remain on the surface for a few minutes. Then, remove solution by vacuuming.